Having a modern or contemporary bathroom vanity is always a great idea for those who prefer a minimalist interior design. They are simple, elegant and much easier to maintain. 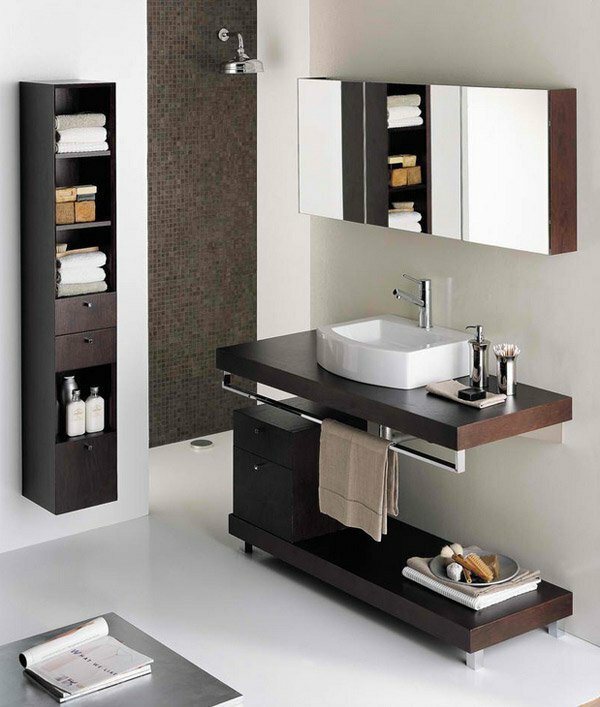 Modern bathroom vanities are more popular these days especially in small apartments and even in modern inspired homes. They are also much cheaper and easier to replace if the need arises. As part of a modern vanity, tall cabinets play a big role in storing everyday items, as well as hiding valuables. They are also easy to maintain due to their simple and sleek design. A lot of people who plans to remodel their vanity set, most of the time go for the modern minimalist design with tall sleek cabinets. For today’s article, we are featuring 15 Modern and Contemporary Tall Cabinets Ideas. These cabinets have various designs and are made of different materials while maintaining a simple and elegant feel. They are not just sleek and simple, they are eye-catching as well. So, feel free to check out these designs for your inspiration, you might find your next tall cabinet here. This twin light oak storage tall cabinet is a perfect fit for a modern bathroom vanity area. A towering contemporary cabinet with double doors is a perfect fit for this bathroom since they can hold a lot of things for storage, and a great addition to a tropical inspired bathroom design. This single door floating contemporary tall cabinet is another great addition to a bathroom since it’s a space saver, sleek, simple and elegant bathroom vanity addition. This contemporary black tall cabinet is simple and elegant with sleek black finish and glass front for easy seeing of the stored items. 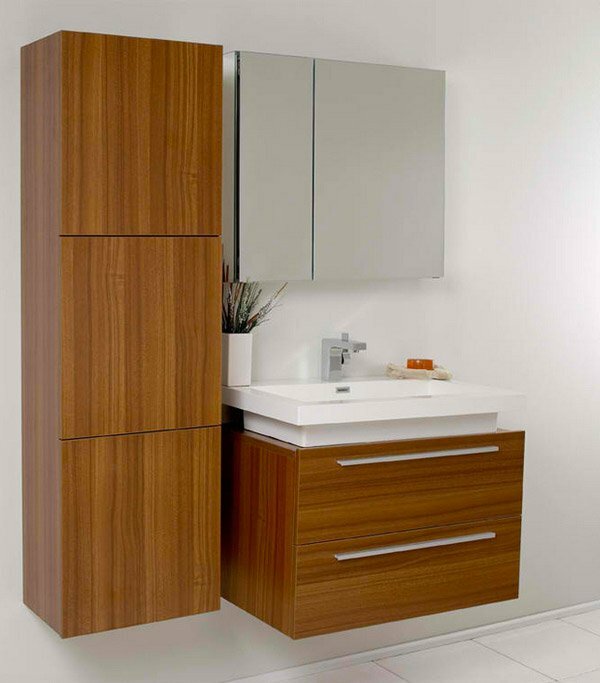 This contemporary tall cabinet is a perfect addition for a “his and hers” bathroom idea, where it is placed in the center and can be utilized by both of them without over-lapping each other. It is stunning and elegant, perfect for a master bathroom. This is a practical idea for a modern vanity, with tall modern cabinet that is thin, sleek and saves space for an additional storage to a modern bathroom. 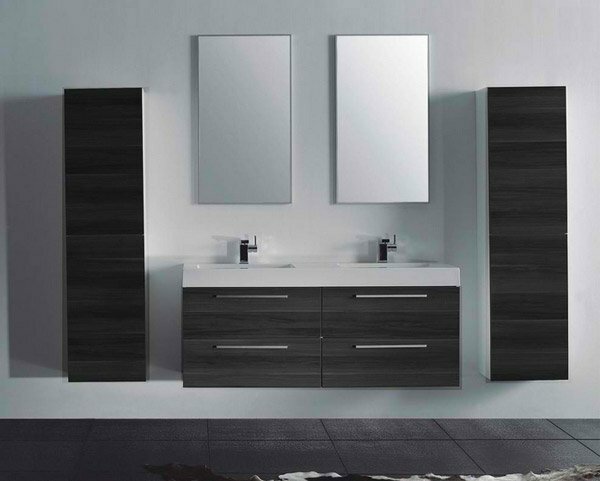 A modern classic vanity, with a modern tall cabinet that utilizes rich natural solid oak that is lasting as well as elegant and sleek. 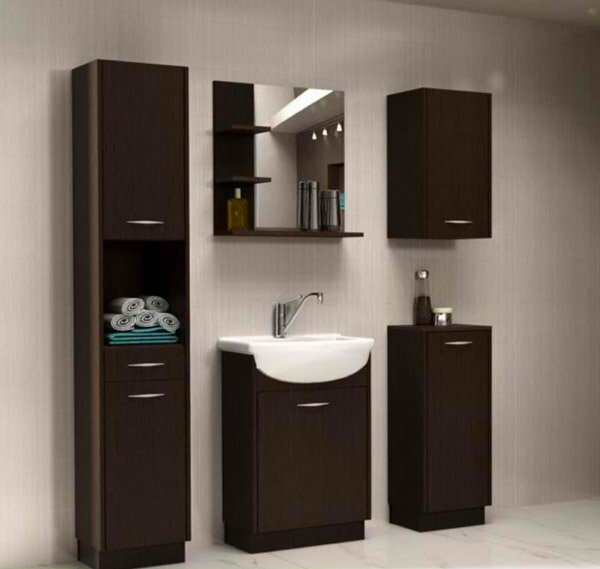 Another space-saving modern bathroom design with a tall bathroom cabinet in light walnut finish, it is clean looking as well as chic, stylish and simple. This modern white vanity set is a perfect contrast to the black background of this bathroom interior especially with the tall sleek cabinet with clean lines. 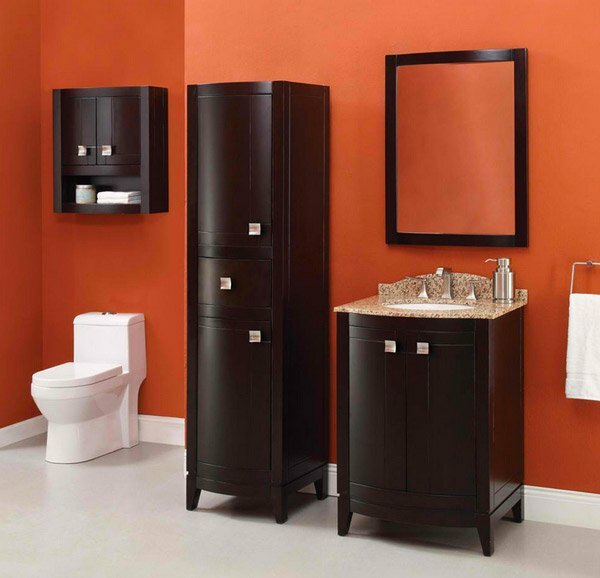 A contemporary black tall cabinet that has a warm color, a great addition to a light colored bathroom to provide contrast, it is elegant, simple and stunning. 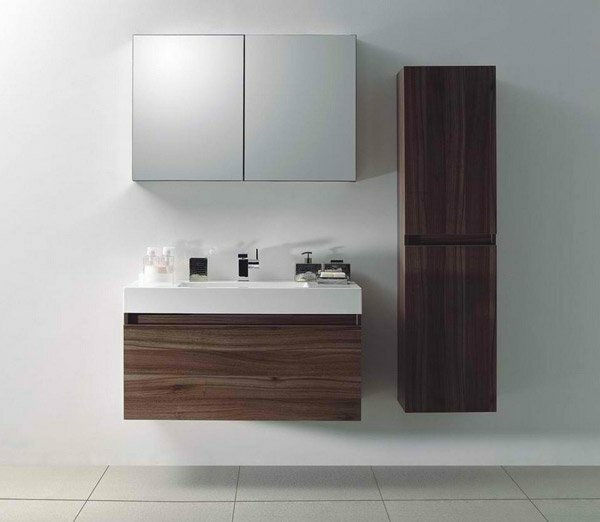 This wall-mounted bathroom vanity is made with high quality veneers, with a tall cabinet that is also suitable as a medicine cabinet or storage for towels and other bathroom vanity items, another simple but elegant modern design. A contemporary inspired bathroom vanity design with a tall wall-mounted cabinet and open shelves for easy access to towels and everyday items, a simple and sleek design. Another twin modern wall-mounted tall cabinet for a modern bathroom vanity set that is constructed using high-quality veneers and soft close hardware. It is simple but elegant for a master bathroom. This contemporary vanity has an attached tall cabinet on the side with a frosted glass door that allows more storage and easy access to everyday bathroom vanity items. It is simple, clean and a practical addition to a bathroom. Another wall-mounted tall cabinet for a contemporary bathroom. It is a perfect addition next to the sink, the brown colored finish is warm to the eyes, setting a warmer tone to the light color vanity background color. 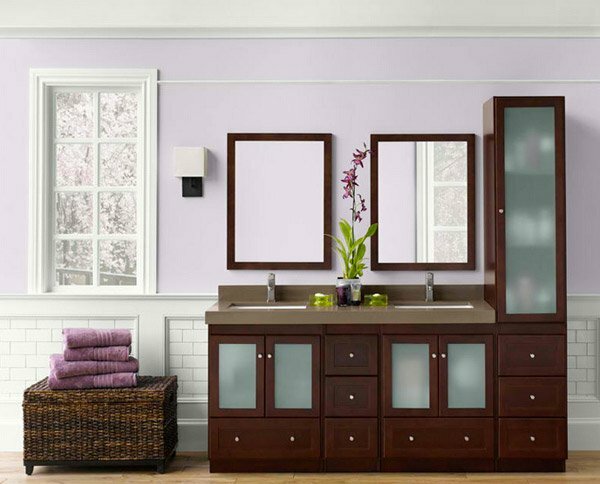 Tall bathroom cabinets are an essential part to any bathroom for organizing everyday bath items. Modern and contemporary tall bathroom cabinets are a very great idea to a minimalist interior since they are small and save a lot of space to move around. They also look very organize and clean. Also, if you opted traditional and elegant bathroom tall cabinet, feel free to check this traditional tall bathroom cabinet too.